Overview - Ever wish you had the chance to get back at the boss who undermined you...the spouse who cheated on you...or the friend who deceived you? 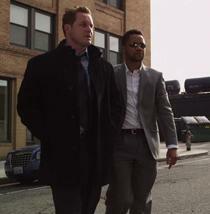 One night, a down-on-his-luck businessman, Allan Campbell (Cole Hauser), meets a mysterious stranger, Jonas Arbor (Cuba Gooding Jr.), who claims to be a professional hit man. Jonas offers to take out five targets, free of charge. Thinking it's a bad joke, Allan jots down his own private hit list. The next day, the people he named start turning up dead, and all the evidence points to Allen. Hunted by the police and haunted by guilt, Allan races against time to stop the murders he set in motion. In this world, vengeance always has a price. Have you ever wondered what Michael Mann's 2004 film 'Collateral' would be like if it starred Cuba Gooding Jr. instead of his fellow 'Jerry Maguire' co-star and ambassador of Kwan, Tom Cruise? Or how about that guy from 'Paparazzi' instead of Jamie Foxx? Or what if it was cobbled together from a script that was seemingly scribbled on napkins? Well, dear friends, wonder no more! 'The Hit List' is the film for you. A terrible, terrible film, just for you. All three of you. Well, maybe less. The story deals with a down-on-his-luck man named Allan (Cole Hauser) who just had a really bad day. A really, incredibly plot convenient, bad day. His boss looked him over for a promotion and instead gave it to some jerky co-worker, he got punched in the eye by a low life criminal, and his wife cheated on him with his best friend. Poor Allan. Poor, unlikeable, uninteresting, terribly written, Allan. Depressed, he finds himself in a bar, where he meets Jonas (Cuba Gooding Jr.) and after some friction, the two get to talking and Jonas confesses that he is really a contract killer and will gladly take out any five guys Allan wants. Poor, drunk Allan thinks he's joking, and proceeds to "jokingly" write down five people who, surprise, surprise, consist of: his boss, his jerky co-worker, that guy who punched him in the eye, his former best friend, and his cheating wife. The next day Allan's boss is found murdered, and putting the pieces together, Allan races off to prevent Jonas from killing any more of the people he… told him to kill (jokingly of course, as one does, with a complete stranger that repeatedly tells you point blank that he's a murderer). What follows is a boring, poorly plotted, uninspired action film that ultimately proves to be entirely pointless. Logic and reason are thrown out the window as characters act in unrealistic, idiotic ways in order to serve the plot. The dialogue is also horrendous, with many characters speaking in plot and theme related bullet points. Gooding's Jonas is perhaps the worst offender. Every other line that comes out of his mouth is an asinine attempt at interesting, philosophical musing, that instead comes across as simply laughable. Performances are all pretty bad, though it's hard to blame the actors considering the material they had to work with. While there actually is some merit in the core of the premise, the execution of the idea lacks any creativity, originality, or even competence. The film "borrows" heavily from the aforementioned 'Collateral,' right down to the look of Gooding's character. He's got the same beard, the same demeanor, and quite possibly the exact same suit as Tom Cruise's Vincent. With the story similar enough, these visual connections just serve to remind us how much better that other film is. With a script as incompetent as this, one would at least hope that the action scenes are executed with some level of skill. Unfortunately, the fairly amateur direction extends beyond the performances and implementation of story. While there are frequent shootouts and even a car chase, none of them offer much in the way of thrills. The car chase in particular features some strange and completely out of place use of slow motion that uses footage that looks like it was shot with entirely different equipment than the rest of the film. Other stylistic flourishes, like some dream sequences and poorly edited flashbacks to earlier scenes, come across as cheesy and lazy. The final gun fight at the climax of the film does offer some minor excitement, but really, you kind of just want the movie to be over by then. I could go on about the film's other shortcomings and talk more about specific areas of dismay, like Jonas' frequent and not so subtle coughing which is supposed to constantly remind the audience that he's got radiation poisoning, or cancer, or something… possibly just a really bad cough, or how it turns out (spoiler alert!) Allan's cheating wife didn't actually cheat on him, and instead just wanted him to think she did, so that he would care about her again (makes sense to me), or how about the fact that when said apparently not cheating wife finds out that Allan put her on his silly hit list, she reacts with less severity than most women do when you leave the toilet seat up. I could do all that and more, but instead I'll just end here and sum things up. 'The Hit List' is not a good movie. It's not even good in a mindless, so bad it's funny, kind of way. It's just bad, and because misery likes company, I will now leave you with one of Jonas' carefully crafted and insightful philosophical ruminations, "The trigger is like a fast forward button. I just skip to the end credits on other people's lives." You know what else is like a fast forward button? An actual fast forward button, something I wish I could've pressed while watching this film. 'The Hit List' is presented in a 1080p/AVC transfer in the 1.78:1 aspect ratio. Overall, the movie looks decent, but not great. The film appears to have been shot digitally and the source looks nice and clean. Detail is strong, showing off every world weary, tired crevice of Gooding's brow, but there is a lack of depth to the picture, giving an extremely flat appearance. Contrast is at times slightly blown out giving an overexposed look and conversely sometimes a bit too low, providing a faded look. Blacks are good, but the occasional low contrast robs them of their potentially inky quality. Colors are alright, but can seem a bit washed out at times, due to a fairly lackluster and unappealing palette. 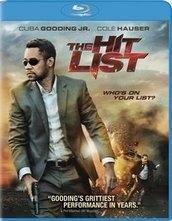 Though technically proficient, 'The Hit List' just isn't a very impressive looking film. The video transfer gets the job done, but it doesn't do much else. The film is provided with an English and French DTS-HD Master Audio 5.1 track, with English, English SDH, French, and Spanish subtitles. Similar to the video presentation, the audio here is merely acceptable and nothing more. Dialogue is clean, providing a crisp delivery to every syllable of Jonas' frequent, oh so thought provoking and instantly quotable words of wisdom. Dynamic range and balance between elements are good. Bass is effective and carries some power in the shootouts and car chases. Surround usage, however, is disappointingly sparse. The track is extremely front loaded, and though there is some nice directionality between the center, left, and right, there is very little activity in the rears, even in the frequent action sequences. In the end, this track suffers from a limited soundscape that bottlenecks any attempt at immersion. Still, even with the front loaded presentation the audio has some kick to it, providing a decent experience. Well, it would have been decent, if every other word out of the characters' mouths didn't make you want to press the mute button. Supplements include some trailers for other, most likely better films, and… that's it. Though I usually welcome some behind the scenes footage or a commentary track, in this case I'm not so sure that I mind the lack of bonus material. Believe me, sitting through the movie is enough. Previews - Six previews for several other Blu-ray releases from Sony provided in 1080p and Dolby Digital 5.1.